I visited Thailand in January, 2012. I spent one month there, but was only able to see Bangkok and Koh Chang, an island paradise about 4 hours (by bus, and then ferry) southeast of Bangkok. I wasn't able to see as much nature as I'd hoped, but the temples I visited were extraordinary. Koh Chang is a tropical paradise located about 4 hours (by bus) southeast of Bangkok. 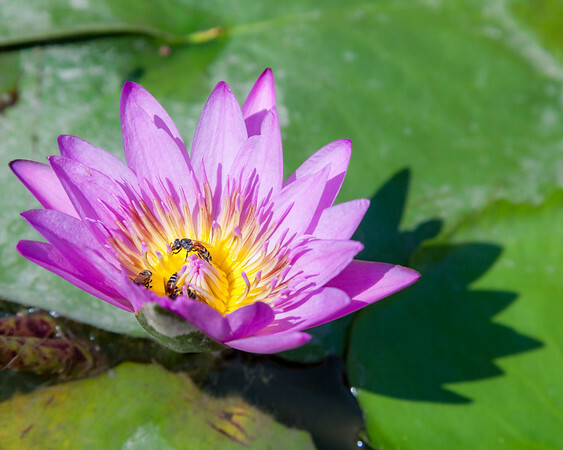 Because of its beauty and proximity to the city, it is a bit of a tourist hot spot. And while many residents of the island make their money from tourism, many more are fishermen. 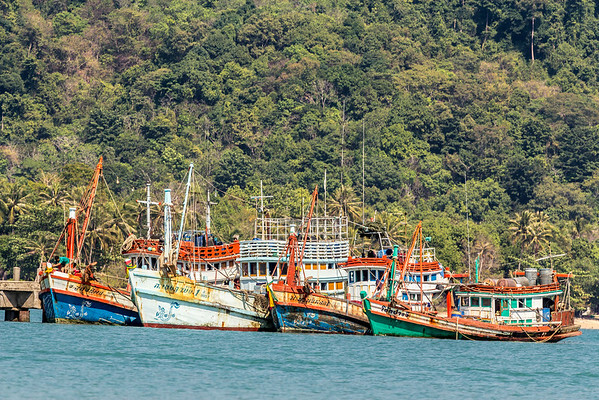 This photo shows some of their brightly-colored fishing boats. Available in the following sizes (Rectangle B): 12x8, 18x12, 24x16, 30x20, 36x24. 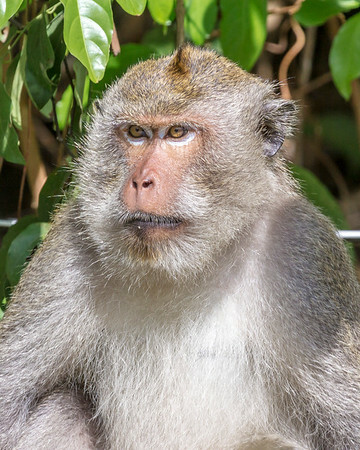 There are lots of macaques to be found on the island of Koh Chang, a few hours from Bangkok. And while they are fun to watch and photograph, one must be a bit careful around them. They can be quite aggressive. Fortunately, I had no such bad luck while photographing this guy, who looks to me like he is wearing eye liner. Available in the following sizes (Rectangle A): 8x10, 11x14, 16x20, 20x24. Koh Chang is a tropical paradise located about 4 hours (by bus) southeast of Bangkok. Because of its beauty and proximity to the city, it is a bit of a tourist hot spot. 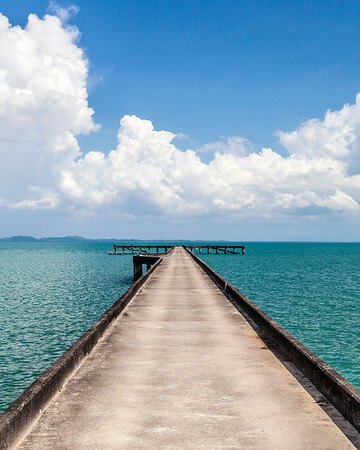 Even so, it's surprisingly easy to leave the tourist trail behind, and find a local village with no accommodation, or an empty pier, such as this one. Available in the following sizes (Rectangle A): 8x10, 11x14, 16x20, 20x24, 24x30. 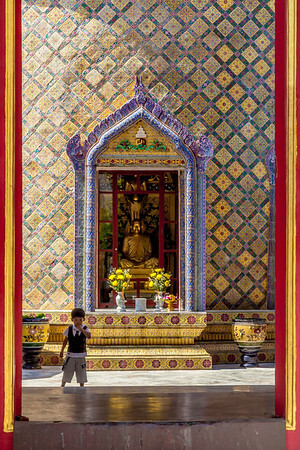 Yet another photo taken in a Buddhist temple in Bangkok, Thailand – this time, Wat Suthat. Available in the following sizes (Rectangle B): 12x8, 18x12, 24x16, 30x20, 36x24, 45x30. 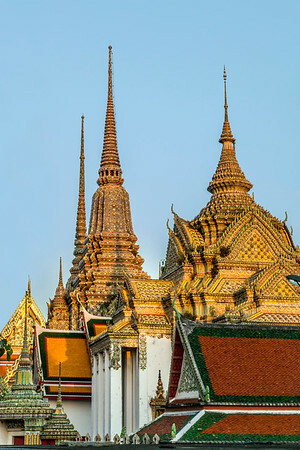 Wat Phra Kaew translates to "The Temple of the Emerald Buddha." The temple complex, visible here, shares its ground with the Grand Palace. Available in the following sizes (Rectangle B): 12x8, 18x12, 24x16, 30x20. Although I wasn't a professional photographer when I visited the Queen Saovabha Memorial Institute in 2012, I certainly looked the part, and was able to convince the workers here to let me take photos of their snake show from ground level, with the snakes, and from a much better vantage point than offered by the bleachers that everyone else had to watch from. The Institute was first opened in 1913 in order to help study and manufacture vaccines for infectious diseases of the day. Today, their basic mission is the same, but they also collect snake venom in order to create antivenom to help people who have been bitten by any of the venomous snakes – and there's no shortage of them – in this part of the world. 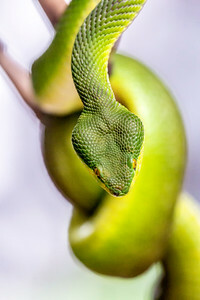 This photo is of a white-lipped tree viper – a beautiful and venomous snake that lives in Southeast Asia. Available in the following sizes (Rectangle B): 8x12, 12x18, 16x24. Although I wasn't a professional photographer when I visited the Queen Saovabha Memorial Institute in 2012, I certainly looked the part, and was able to convince the workers here to let me take photos of their snake show from ground level, with the snakes, and from a much better vantage point than offered by the bleachers that everyone else had to watch from. The Institute was first opened in 1913 in order to help study and manufacture vaccines for infectious diseases of the day. Today, their basic mission is the same, but they also collect snake venom in order to create antivenom to help people who have been bitten by any of the venomous snakes – and there's no shortage of them – in this part of the world. 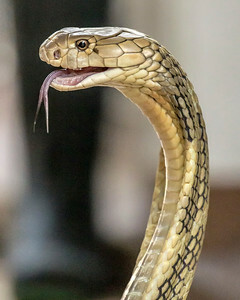 This photo is of one of the most easily recognized snakes in the world – the cobra. Available in the following sizes (Rectangle ! ): 8x10, 11x14, 16x20. In my opinion, Loha Phasat is one of the most underrated structures in Bangkok. In a city with so many temples with gold, dome or spire rooftops, it was nice to find one with a bit of a different look to it, which is exactly what happened when I stumbled upon Loha Phasat. All the spires here were black, instead of the traditional gold, but upon looking this temple up to write this little story, I discovered that since I took this photo, all these spires have been painted gold, in the traditional style. It looks great either way. Look in the lower, right hand corner of this photo to see a monk listening to a radio straight out of the 1950s. Available in the following sizes (Rectangle B): 12x8, 18x12, 24x16, 30x20, 36x24, 45x30. In my opinion, Loha Phasat is one of the most underrated structures in Bangkok. In a city with so many temples with gold, dome or spire rooftops, it was nice to find one with a bit of a different look to it, which is exactly what happened when I stumbled upon Loha Phasat. 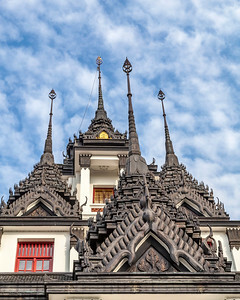 All the spires here were black, instead of the traditional gold, but upon looking this temple up to write this little story, I discovered that since I took this photo, all these spires have been painted gold, in the traditional style. It looks great either way. Available in the following sizes (Rectangle A): 8x10, 11x14, 16x20, 20x24, 24x30, 30x40. Wat Benchamabophit is one of so many Buddhist temples in Bangkok that it is impossible to keep track of them all. Also known as the “Marble Temple,” it is one of the best-known in the city, and houses 52 Buddha statues, each showing a different “mudra” (sign). 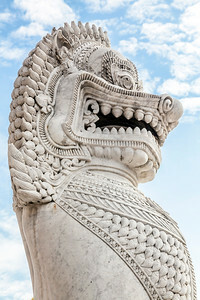 There are also two “Singhas,” or lions guarding the main entrance to the temple. This photo is of one of them. Available in the following sizes (Rectangle B): 8x12, 12x18, 16x24, 20x30, 24x36, 30x45. Wat Benchamabophit is one of so many Buddhist temples in Bangkok that it is impossible to keep track of them all. Also known as the “Marble Temple,” it is one of the best-known in the city, and houses 52 Buddha statues, each showing a different “mudra” (sign). 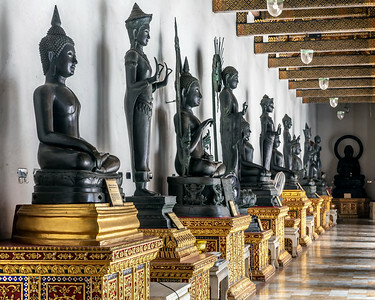 These statues were collected by Prince Damrong Rajanubhab for his king. Available in the following sizes (Rectangle A): 10x8, 14x11, 20x16, 24x20, 30x24, 40x30. 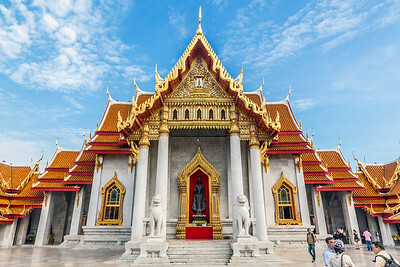 Wat Benchamabophit, also known as the Marble Temple, is a Buddhist Temple in Bangkok's Dusit district. 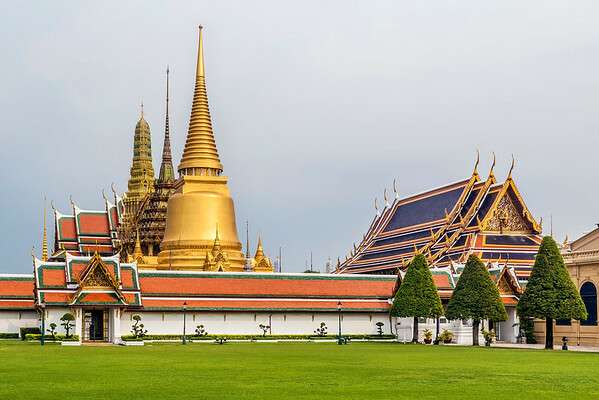 Although it is a fairly major tourist attraction, I didn't feel overwhelmed by crowds on my visit, especially when compared to the Grand Palace, or Wat Pho, home of the famous “Reclining Buddha.” Available in the following sizes (Rectangle B): 12x8, 18x12, 24x16, 30x20, 36x24, 45x30. Bangkok is a great city. It has the hustle and bustle of many large cities of similar size, but also has quiet, peaceful temples in great numbers. And there are tons of street markets, and some of the best street food on the planet. 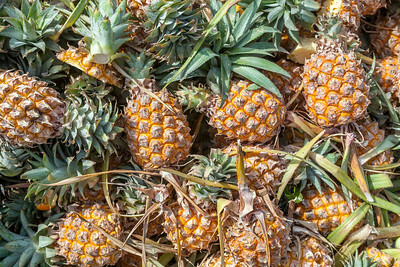 I took this photo of a bunch of pineapples at one of the countless street markets. Available in the following sizes (Rectangle B): 12x8, 18x12, 24x16, 30x20, 36x24, 45x30. Bangkok is filled with temples. This one was on the grounds of Chulalongkom University, and when I stopped here, there was some type of gathering taking place. Street food stalls filled the area, and the smoke visible at the top of this image is coming from the many street food vendors operating nearby. Available in the following sizes (Rectangle B): 8x12, 12x18, 16x24, 20x30, 24x36, 30x45. When I visited Bangkok, in 2012, most of the temples and interesting sites were either cheap or free to enter. The Grand Palace, however, was a bit more expensive, and I knew it was going to close within an hour or so of when I got here, so I decided to shoot it from outside, and to actually go in on another day. The last light of the day illuminated many of the spires and pagodas with a beautiful, golden light. Available in the following sizes (Rectangle B): 8x12, 12x18, 16x24, 20x30, 24x36, 30x45. 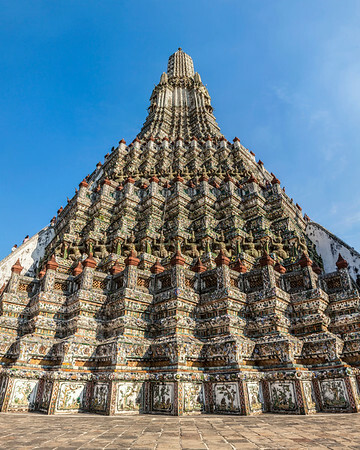 Wat Arun, which translates to “Temple of Dawn,” is a Buddhist temple in Bangkok. It lies on the west bank of the Chao Phraya River, which flows through Bangkok, and since while I was in Bangkok, I was staying on the other side of the city, I had to take a ferry across the river to get here, which was an adventure in itself. 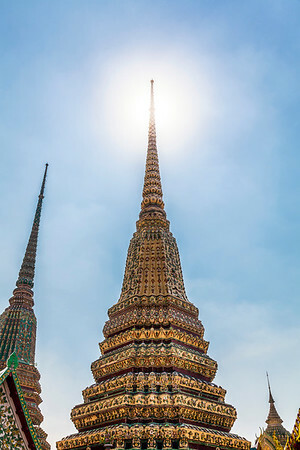 It is one of Bangkok's most well-known landmarks, and truly a sight to behold. Available in the following sizes (Rectangle A): 8x10, 11x14, 16x20, 20x24, 24x30, 30x40. 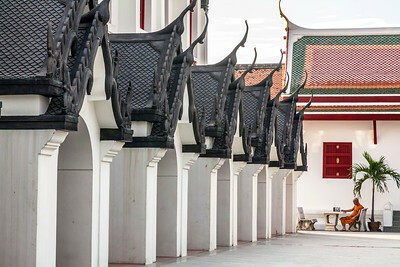 Wat Pho is famous for housing the “Reclining Buddha.” And while housing the 15 meter high, 43 meter long Buddha statue may be Wat Pho's claim to fame, the temple also contains over a thousand images of Buddha, and a working Buddhist monastery. There are also over 90 chedis (or stupas), of varying height, including the one at the center of this photo. Available in the following sizes (Rectangle B): 8x12, 12x18, 16x24, 20x30, 24x36, 30x45. 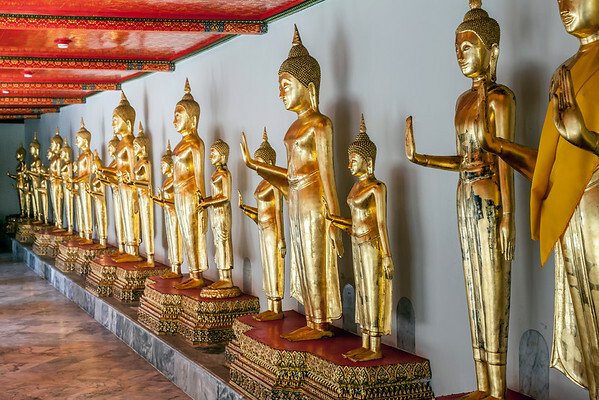 A row of standing, golden Buddhas found in Wat Pho, home of the famous Reclining Buddha, in Bangkok, Thailand. Available in the following sizes (Rectangle B): 12x8, 18x12, 24x16, 30x20, 36x24, 45x30. 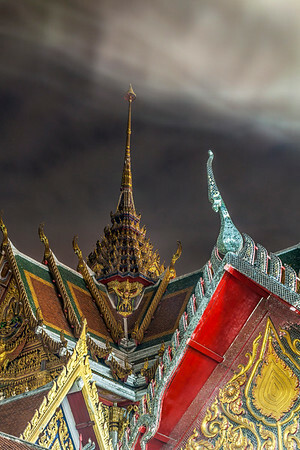 There are so many Buddhist temples in Bangkok, Thailand, it is hard to keep track of them all. I took this photo at Wat Ratchabophit. This temple was built during the reign of Chulalongkorn, or Rama V, who lived from 1853 to 1910. Available in the following sizes (Rectangle B): 8x12, 12x18, 16x24, 20x30.